All Is Lost is a drama about a yacht floating aimlessly in the Indian Ocean. We do not know the name of the sailor. Suddenly his ship has been punctured by an enormous metal shipping container adrift loose in the sea. The resulting hole is the start of where this man’s problems begin. 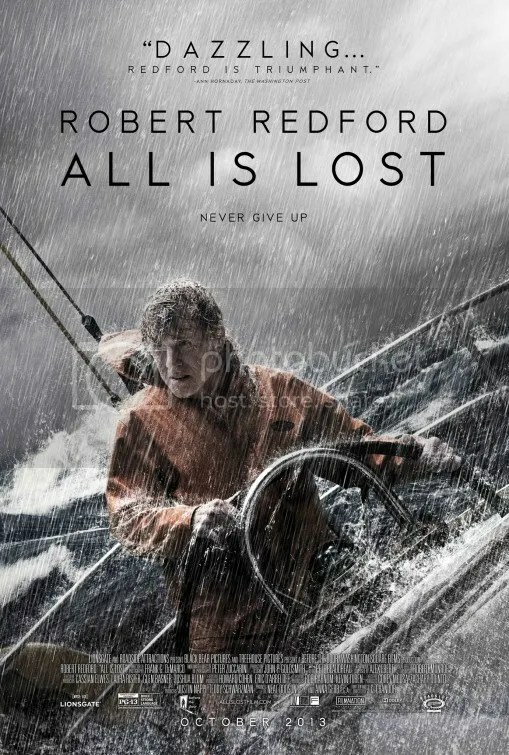 All Is Lost is a most peculiar little picture. Other than some narration in the beginning, this is a nearly wordless production. Our man, as he’s listed in the credits, recounts his dire written message directed at some unnamed people. He has given up. Then we flashback 8 days. We observe how our hero’s situation has deteriorated up to that point. Without conversation, we must rely on the character’s actions to communicate his predicament. Robert Redford offers a fascinating portrayal, one that will undoubtedly earn an Academy Award nomination. It’s the kind of understated achievement that usually goes unnoticed. However I predict this will win him tons of awards. Surprisingly Redford has been nominated just once for an acting Oscar in his entire career (The Sting). Admittedly that makes him a sentimental choice, but this performance also happens to be among his very best. He does great work here. Yet despite his incredible accomplishment, I did not enjoy this movie much. For the full 106 minute runtime, we simply watch a character’s fate grow from bad to worse. We see our man repair damages, pump water out of the main cabin, distill drinking water and shoot a flare gun – all in wordless silence. It’s all quite methodical and emotionally cold. There are only the sound of the waves and the musical score to direct our feelings. There is no history, no reasons for his trip, nor family we can connect to this man. We know only random bits than we can glean from tiny clues of the narrative. Part of the “fun” is putting the evidence together to assemble the background of this man’s life. He’s rich obviously. He owns a yacht. Or does he own it? That’s not clear. We are able to tell he has loved one(s) given the opening voice-over. Or is that directed to friends? Ok, we can see he is an old man, possibly in his late 70s. That’s really all we can deduce. I admire what director J.C. Chandor is trying to do with All Is Lost. He also directed the studious financial study Margin Call, which was nothing but talking. In All Is Lost, Chandor admirably tries to convey helplessness in the most subtle manner possible, sans dialogue. So insubstantial, it barely registers as a film. Its adherence to minimalism is remarkable. It’s a noble exercise, but it doesn’t resonate as entertainment. It feels like an experiment. You can argue, we don’t need a backstory to be invested. We should care because he is human. His will to survive is the plot. But without the context of a face of someone he misses or even a personality for the man himself, our sentiments are not fully engaged. He is a completely inscrutable protagonist. He rarely shows emotion except in one exasperated release where he utters one loud obscene word. Additionally for the majority of the movie, our man is presumably such an expert seafarer, he appears cool and collected. He’s calm so we’re calm. The stakes don’t seem that high. That changes but by then it’s too little, too late. This entry was posted on October 27, 2013 at 8:00 pm and is filed under Action, Adventure, Drama with tags 2013. You can follow any responses to this entry through the RSS 2.0 feed. You can leave a response, or trackback from your own site. Nice review. Been thinking of catching this next weekend since everyone’s been saying Redford will win the Oscar. It’ll be interesting to see how the Oscar race pans out. We’ve got 5 months until the actual event. It’s still fun to predict. I highly doubt Redford won’t get nominated, but win? I sure do hope so because this is one hell of a performance unlike anything he’s ever done, or anything I’ve seen in quite some time from anybody. Good review Mark. I’d much prefer to watch Redford in Butch Cassidy and the Sundance Kid, The Sting, or All the President’s Men. However, I can still appreciate his performance in All Is Lost, if not the movie. We don’t disagree. I concur with everything you said. You just enjoyed it ½ star more than I.
Woww…..great review as per usual! But I’m shocked. I will cautiously enter this one (if I do now, that is), and in fact I *almost* regret reading this because I had no idea it was virtually word-less, but I suppose I could have assumed it would be a quiet script, and also I don’t think I’ll mind that much. In fact, that might be a good warning. What can I say? It didn’t affect me. I’m a bit surprised critics have been so taken with this film. There’s not a lot to grab onto. Great review, Very interesting take on this film. I seem to be in the minority opinion. However I notice that quite a few of the reviews classified as positive are actually negative reviews on RT. For example, these are incorrectly listed as positive reviews: Sandy Schaefer from ScreenRant, Simon Gallagher from What Culture and Shaun Munro from Film School Rejects. Too bad. I read a praising review of this by Stephen Rea (Philly Inquirer), and he seemed to love Margin Call and All Is Lost. I’ve seen neither, but I’ll try and watch Margin Call to see if I think it’s “nothing but talking,” as you seem to say, before watching this one. They’re both such different films. Incidentally, Margin Call’s intellectually wordy script was nominated for an Oscar. I know. My point was that if I was in the same boat (no pun intended) as you with Margin Call, I should just skip this one. Interesting. I can’t wait to see this, despite your tepid response. Soon, I’ll be able to let you know whether or not I agree. Thanks, as always, for the great review. There are so many movies out right now that I can’t wait to see: 12 Years a Slave, Dallas Buyers Club, About Time, Kill Your Darlings, Blue Is The Warmest Color, Ender’s Game. That looked like a grand list…until “Ender’s Game”. lol. I’m surprised Redford wasn’t nominated for “All The President’s Men”. I watched that one about a year or two ago for the first time, and thought it was pretty excellent. Talk about a story escalating from a couple nosey reporters. lol. “All is Lost” just made it here this week. I may try to catch it. This one sounds a bit like “Cast Away”. I still haven’t watched “Cast Away”. I have the DVD, though. I need to watch that one in the near future. All the President’s Men is a really great film. Dustin Hoffman wasn’t nominated either, but Jane Alexander and Jason Robards were, with the latter actually taking home the award for his supporting part. Really had a hard time watching it and when he swears that was the exact feeling I had because the movie had not finished yet. Like you say it simply does not manage to engage. My audience laughed when the credits showed up which is not a good sign if you have just seen a movie where you supposed to care about this character. That’s an interesting audience reaction. I didn’t hear any laughter at my screening. So EW (and incidentally, just about every other source I’ve found) is heralding Matthew McConaughey (Dallas Buyers Club), Robert Redford, Tom Hanks (Captain Phillips), Bruce Dern, and Chiewetel Ejiofor as the five upcoming Best Actor nominees. Would you agree? The actual nominees will undoubtedly be slightly different, but I’d agree the 5 you listed are the frontrunners right now. I haven’t clicked the link yet, but I read EW as a mail order periodical, not online. Yes I have a subscription. I’m talking about the print periodical too. Maybe I’m missing an issue. I saw it in the Nov 15th Holiday Preview. Which issue did you see Oscar predictions in? Here’s an idea for a prequel: a sequence of meetings between the screenwriters of this film and the people they’re trying to talk into paying for the production. By some method of mind control none of us in the audience has never heard of before, the screenwriters succeed! Actually the most interesting thing about this movie is that, for reasons I don’t understand, it isn’t QUITE as boring as its plot synopsis suggests it ought to be. The script is all stage directions. Even at its small budget ($8.5 million) it still has yet to recoup costs. If When Robert Redford wins the Best Actor Oscar, that will change. They ought to have a new academy award category: “most physically demanding role relative to the age of the actor”, in which case Robert Redford would be a shoe-in. Agreed. Apparently he did his own stunts. I watched this on the way back from London to the USA (had a layover in London after Paris). Also watched August: Osage County. Take a wild guess on which one DIDN’T bore me to tears. Also: I saw Inside Llewyn Davis on the way there. Why was I so lucky that of the three films I chose, two of them bored the living s%$#@t out of me? August: Osage County was my favorite of the three so we agree on that.